O comparație grăitoare și mai rar făcută între protestele din Ucraina și cele din Tailanda, cu accent pe dimensiunea geopolitică a acestora. De meditat. UPDATE December 2, 2013 – 1555 Local Time – Taking a cue perhaps from the Western-backed pro-EU mobs, Thailand’s anti-regime protesters have been seen preparing bulldozers of their own to breach barricades. The West has already hypocritically condemned protesters in Thailand – since it is a Western backed regime they seek to oust. Will they compound their hypocrisy and condemn the use of the bulldozer as well, while applauding mobs in Kiev for doing likewise? December 2, 2013 (Tony Cartalucci) – When is a protest good, just, progressive, and defensible? One might think there was a single answer to this question based on an objective set of metrics. But in reality, according to the West, protests are only good so long as they serve their interests. 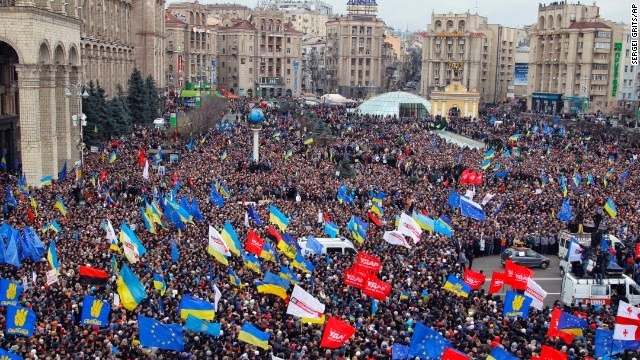 Ongoing protests in Ukraine and Thailand have both featured protesters attempting to storm and hold government buildings. Both appear to be preparing lengthy sieges of buildings they are unable to take, and both have the goal of ousting the governments in their respective nations. However, the West finds one of these noble, the other not.